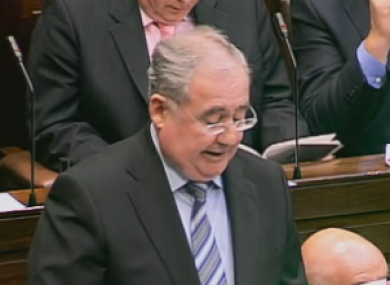 Communications minister Pat Rabbitte tells the Dáil that the government will dispose of a minority stake in the energy provider. THE GOVERNMENT has agreed to sell off a minority stake in ESB, it has confirmed today. Communications minister Pat Rabbitte told the Dáil this afternoon that the sale of a partial stake had been agreed in principle by cabinet this morning, but that the particular size of the stake had not yet been agreed. A group jointly chaired of Rabbitte’s Department of Communications, Energy and Natural Resources, and of Brendan Howlin’s Department of Public Expenditure and Reform, will form to make concrete decisions on the sale. Rabbitte said the committee – which had “very many complex, complicated, intricate decisions” to take, and that it would report its conclusions for the sale of ESB by the end of November. He refused to estimate on the size of the stake that the government would sell, or the amount it could expect to fetch, but insisted there was “no question” of the government handing over full control of the company. The minister had yesterday insisted that the government was not likely to dispose of a majority stake – saying the government had learned from the mistakes from the flotation of Telecom Éireann, which he blamed for Ireland’s poor broadband network. The ESB said it had no comment on the decision, saying the ownership of the company was “a matter for the shareholder”. The government decided earlier this summer to leave the ownership of the national grid with ESB, while Eirgrid would take over the management of it. Rabbitte this afternoon clarified that this decision had been taken with the input of all relevant shareholders, including ESB staff. The sale of state assets is required by the government’s deal with the EU and IMF, which demands that the state raise at least €2bn through the sale of state assets. Rabbitte told the Dáil that there was “growing recognition from Europe” that the Irish government was doing whatever it needed to secure the country’s economic future, and that this sentiment was growing with “every day that passes”. Other assets likely to have been discussed at the cabinet meeting this morning would include Bord Gais and Aer Lingus – with transport minister Leo Varadkar previously admitting that the sale of the flag-carrying airline was likely because he no longer considered it ‘strategically vital’. Your say: Which State asset should we sell off first? Email “Government decides to sell minority stake in ESB”. Feedback on “Government decides to sell minority stake in ESB”.